The role of the party wall surveyor is to facilitate communication and negotiation between all the parties affected by a party wall matter. The timely appointment of an experienced and knowledgeable surveyor will reduce the risk of disputes arising by ensuring that all those involved feel properly informed and represented. The building owner will usually be responsible for all the costs relating to a party wall matter. During your initial free consultation our surveyor will be able to give you a better idea of which services will be appropriate to you. A detailed quotation can be provided before you commit to appointing an Adair Associates surveyor to represent you. A single surveyor can act jointly for the building owner and adjoining owner/s. In this case the surveyor is expected to act impartially within the bounds of the Act. He/she would be responsible for contacting all the relevant parties, issuing all party wall notices and responses, co-ordinating meetings and negotiations in order to produce the necessary party wall awards. When handled in a professional and timely manner the possibility of disputes arising is minimised, thus reducing the possibility of delays and additional costs. 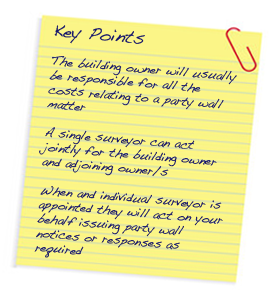 When an individual surveyor is appointed they will act on your behalf issuing party wall notices or responses as required and attending any meetings necessary in order to produce a party wall agreement. This is the official notification which must be issued to adjoining owners at least one month before works are to commence. Your appointed surveyor will ensure that the information it contains is all in accordance with the Party Wall Act. This is a written response to the party wall notice and is an opportunity for an adjoining owner to request additional works be carried out. Your appointed surveyor will advise you on your rights and will draft and serve the counter notice in accordance with the Party Wall Act. This is the document which outlines the negotiated terms by which the works are to proceed. The appointed surveyor/surveyors will draft this document in accordance with the Party Wall Act taking into account all the parties requirements, concerns and desires. When this document is satisfactory to all parties, they will sign it and work can commence. The appointed surveyor can be engaged to attend the project at regular intervals in order to ensure that works are being undertaken in accordance with the party wall award. Depending on the nature of the works to be undertaken and the age/state of repair of the existing properties it may be considered necessary to undertake a condition survey. The appointed surveyor can undertake this work and return at a specified time to report on any changes which may be deemed to have been caused as a result of the works. The party wall award will usually include details of how remedial works will be undertaken and how they will be paid for..